Jacob Eason's fall jamboree highlights point to the future of UGA football. Who needs the coffee with the UGA Recruiting Rewind this morning? There’s already plenty of artificial stimuli to go around with a game week for UGA, the SEC and the rest of the country. This past weekend also offered up the start of high school football games that count across the Southeast. Jacob Eason’s high school team on the left coast even got into the mix with its jamboree games. That means every player and team associated with UGA football and its recruiting efforts will have a true won-loss record after this weekend. What’s the best way to keep up all with all of that? Why don’t you see if the Daily DawgNation email can fill the bill? That’s an early afternoon email newsletter which curates the top UGA-related content every day. It is also free. The only thing better than a daily UGA email newsletter is a free daily UGA email newsletter. That’s enough self-promotion on our part but cut us so some slack. Tomorrow will be the one-month anniversary of the AJC’s new DawgNation site. We’ll have to find a cake after we get through with Monday’s Rewind. So how good are all these 4-star and 5-star recruits anyway? That’s what our weekend honor roll hopes to convey. Recruiting potential is great and all but how does that translate into production on the field where it really matters. DawgNation pops up an honor roll post early Saturday morning on the site that recaps how every UGA commitment and also the major 2016 targets fared on Friday night. It will be constantly updated. That will fulfill one of the core tenets of this site. We aim to provide a lot of info in a hurry-up-no-huddle manner. That’s the same concept at work with the Daily Rewind and the aforementioned email newsletter. We want to bring you UGA football news that matters with a sense of urgency to it and also navigate through that fairly insane amount of recruiting information that’s out there. 5-star QB prospect Jacob Eason‘s name has already come up once during Rewind, but here’s what all the fuss is about. We got our hands on some Hudl video from the opening act of his senior season from that jamboree. There’s a throw off his back foot that leads off the clips, but I was more impressed with seeing him throw more on the run and also the latter efforts along that reel. The recruiting analysts feel if there’s one thing to kick the tired about when it comes to Eason, it is that he’s only “above-average” or “good” when throwing on the run. It looks like Eason intends to show there’s more to his game than that this fall. Eason wasn’t the only UGA commitment making highlights over the weekend. 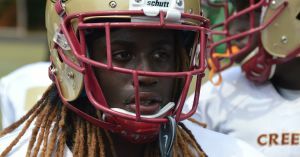 Coconut Creek, Fla., standout Malek Young put up his team’s first 21 points on the board against Marist and might have authored the top clip in an impressive body of work across his prep career. Rabun County WR Charlie Woerner also got into the act with a long touchdown catch. Young should be a great one in the secondary in Athens, but he told the AJC this weekend that he’s only 95 percent committed to UGA. What? Are alarm bells going off in your head about that? They shouldn’t be. Whenever I hear a recruit share a figure about how committed they are a school in August of their senior year, I take it with a grain of salt unless it is less than 100 percent. These are adrenaline-fueled aggressive football players. They are not even 100 percent committed to eating a Ruth’s Chris steak at this point of their lives. UGA DB commitment Chad Clay gave an answer similar to what Young said this weekend earlier this month. That was just another example of a kid being honest about his recruiting. He’s had some time to think about it and he told the AJC over the weekend that he was still strong with UGA. Clay’s an early enrollee at that so don’t look for him to spend too much time looking at other suitors other than perhaps Oklahoma this fall. Junior OL Netori Johnson is a great interview. The Cedar Grove road grader speaks from the heart and doesn’t sugar coat anything. He also always finds a way to smile and have fun with it all and he’s also got the coolest hairstyle of anyone in the trenches this fall. He told the AJC this weekend that UGA offensive line coach Rob Sale was the “realest” coach he’s encountered on the trail. He felt more confident in what Sale has to say than even the coaches he’s committed to at Alabama. That’s the great news for UGA’s sake. The bad news is he now sees Auburn as his co-No. 2 with UGA behind Alabama. 7. Another Manning vs. Brady coming to the SEC? Who’s the top quarterback recruit in the nation this year? The answer to that question is usually either Eason or IMG Academy’s Shea Patterson. Patterson had a great summer and leaped over Eason in the eyes of a lot of recruiting analysts this summer. Patterson will early enroll at Ole Miss. Eason will do the same at UGA. That’s going to set the stage for even more comparisons regarding their careers going forward. What sort of relationship exists between the two? Patterson told the AJC that the two are friends and have gotten to know each other well over the camp and recruiting showcase circuit over the last few years. It will be interesting watching these two on Fridays and Saturdays over the next four years. Former UGA standout Terrence Edwards continues to evaluate UGA commitments for DawgNation. His takes are always interesting given his status as one of the program’s all-time greats at receiver. 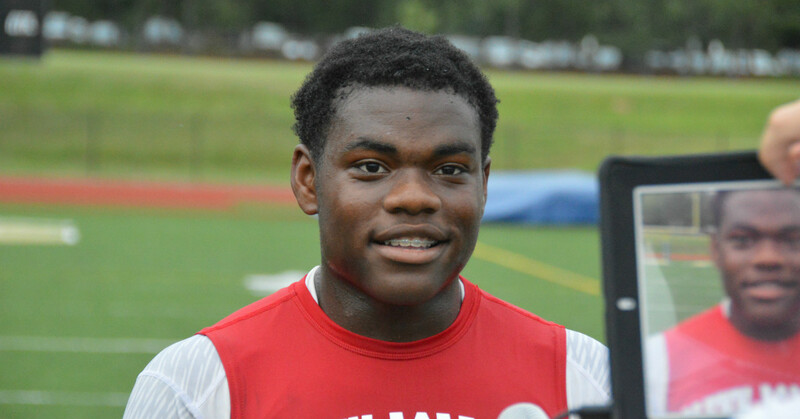 He shared his insight on Glynn Academy junior Deejay Dallas over the weekend. His evaluation can be summed up in one word: Playmaker. It appears that UGA is going after as many defensive tackles as receivers for its 2016 signing class. UGA has already gotten commitments from four wideouts and is poised to take at least that many defensive linemen as well. Tyler Clark and Julian Rochester have already committed to play for line coach Tracy Rocker. UGA would also welcome a commitment from other talents like Derrick Brown, Rashan Gary, and Michail Carter. 5-star DT Dexter Lawrence was a name we hadn’t heard a lot about as any prospect at that spot, but he’s decided he will also take a visit to UGA this fall, too. Texas CB Jared Mayden has committed to Oregon, but he’ll take an official visit to UGA this fall. That’s interesting as he released a leaders list earlier this summer and it didn’t include UGA. That might have been because he had yet to receive an offer from UGA. It looks like UGA is trending well with the nation’s No. 11 cornerback, but I’ll chalk this up as kid wanting to take a trip to see what SEC football is all about more than anything at this point. There are always a lot of Southern kids who trek to California and Oregon to see another slice of America on someone else’s dime with their official visits. That’s what Mayden’s interest right now seems like at this point. UGA defensive coordinator Jeremy Pruitt can recruit. There’s no doubt about that. That’s why he’s already hooked a great talent from Coconut Creek High in Florida. That’s Malek Young. Well, it appears that he’s given UGA a chance with the nation’s No. 4 cornerback from the same high school team. Trayvon Mullen told the AJC this weekend that there’s a ‘strong possibility‘ he will take an official visit to UGA for the Alabama game this fall. 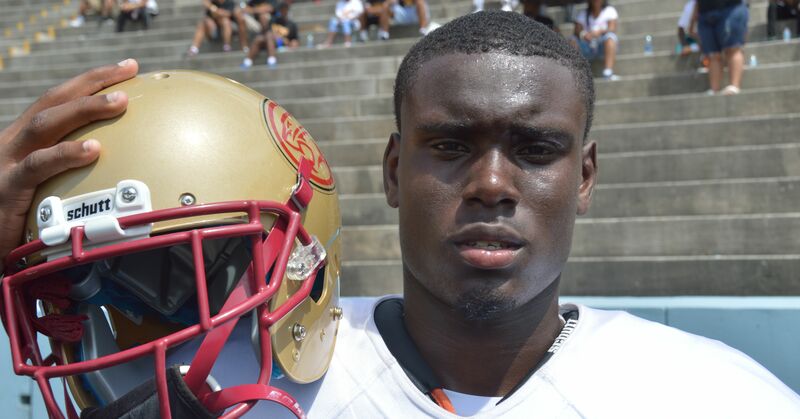 4-star receiver Binjimen Victor is also thinking about taking that official visit to UGA with Young and Mullen. He told the AJC this weekend that he already has two official visits in mind to Ohio State and Tennessee, but he’s thinking about UGA for one of those, too. Victor wore Ohio State gloves on Saturday and said that UGA got a late start on recruiting him or UGA would have an even better chance at him right now. The 6-foot-4 standout is rated as the nation’s No. 9 receiver for the Class of 2016. Hallandale, Fla., receiver Joshua Hammond is an explosive athlete. He’s committed to Florida but gave the UGA coaches a good glimpse of what he can do when he tore it up at Sanford Stadium back in June at a Mark Richt 7-on-7 football camp. Well, it appears he is coming back. According to a report, Hammond will take an official visit to UGA later this fall. 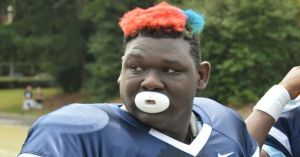 He’s a 4-star recruit and plans to attend the Alabama game. DawgNation got the chance to watch Sprayberry junior RB Trey Sermon work on Friday night. He’s considered by some scouts to be the top RB in the state this fall regardless of grade level. He likes UGA, but it sounds like he really likes Ohio State at this point. NEXT Analysis: Which newcomers will play, and which will redshirt?